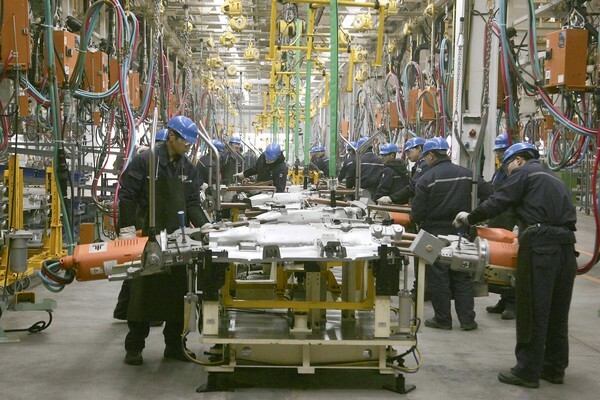 Workers assemble automobile parts at the new Changan Ford Mazda automobile plant in Chongqing, China. Ford Motor Co.’s new factory in this smog-shrouded boomtown is the size of 17 football fields and cost nearly half a billion dollars. It’s also the latest major push by a Detroit automaker in one of the global auto industry’s most important battlegrounds. The facility, which opened Friday, is Ford’s fourth assembly plant in China and part of an effort to catch up with rivals, including General Motors Co., which now sells more cars in China than it does in the United States. How Ford responds to the China challenge could help shape the company’s future. The world’s No. 1 car market, China posted vehicle sales of 18.5 million last year, compared with 12.8 million in the U.S.
“Now is the time we really need to set our sights to accelerate,” David Schoch, head of Ford China, said in Chongqing on Friday. Whether Ford is arriving too late to the party remains to be seen. The company’s first passenger car wasn’t launched in China until 2003, when VW and GM were already selling hundreds of thousands of units. The good news is that Chinese consumers love foreign nameplates, even if most of those Fords, Chevrolets and Buicks are assembled in China. That’s a rare success for U.S. companies looking to crack the China market. Foreign brands, which account for about 70% of sales, are considered to be of higher quality and more prestigious than homegrown Chinese vehicles. But Ford first must deliver more cars and showrooms for customers to find them. Ford sold just over a half-million units in China last year, well behind GM’s 2.6 million and Volkswagen’s 2.3 million. GM has nearly six times the number of dealerships. Chongqing resident Alan Zhang was determined to buy a foreign model, concluding that a Chinese car “doesn’t give me any status.” His first choice was a Volkswagen Golf. But he gave up after a VW dealer told him he had to wait five months and pay $3,000 to join a waiting list. Instead, he strolled to one of GM’s 2,700 showrooms recently and plunked down $16,000 for a Buick Excelle with buttery brown leather interior. In response, Ford plans to introduce 15 new vehicles into China over the next three years and boost its dealerships by nearly half to 680 showrooms. Many of those are planned forChina’slesser-known cities, where competition and growth are more favorable. Ford is not alone in seeking to boost China sales. Chrysler Group, which sold only 23,000 vehicles in China last year, is also planning to scale up its presence in the world’s second-largest economy, with plans to boost sales of its Jeeps and SUVs. Meanwhile, GM, whose success in China has helped it regain its crown as the world’s largest automaker, added an entry-level brand in China last year called Baojun to bolster a lineup that already includes the hot-selling Buick and Chevrolet. Had Ford beefed up its presence in China sooner, it might have reaped the full rewards of two years of staggering sales in China — 2009 and 2010 — when the total number of vehicles sold grew by 46% and 32% respectively. The Chinese market cooled markedly last year, with vehicle sales up only 2.5% compared with 2010. But Ford’s Schoch isn’t fazed. “It’s not the torrid pace we saw in 2009 and 2010, but nevertheless there’s very good growth opportunities,” he said. A big step came Friday with the introduction of the new Ford Focus. Assembled in the new Chongqing plant, the plucky sedan with a hatchback option also features a voice-activated control system designed to recognize some of China’s many regional accents. The car will probably sell for $17,000 to $24,000, depending on the options. It’s aimed at first-time car buyers, a group that makes up 65% of the Chinese market, according to Ford. Ford hopes the Focus will seize ground in China in the crowded segment for small sedans, which was led last year by the Toyota Corolla, Buick Excelle and Volkswagen Lavida, according to IHS Automotive. Despite its late start, Ford is still in a more enviable position than foreign automakers that have yet to launch operations in China, an enterprise that requires a joint venture with a local manufacturer. Concerned about overcapacity, China’s central government recently made it more difficult for its domestic automakers to partner with an international firm. That could stymie the likes of Subaru, Renault and Fiat. It also complicates Ford’s plans to break free of its three-way partnership with Mazda and its local manufacturer, Changan. 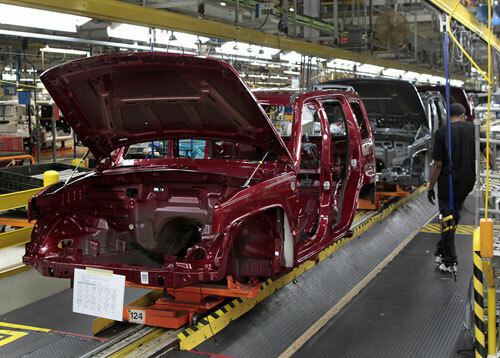 Chrysler Group LLC's production line for the Jeep Liberty in Toledo, Ohio. BEIJING, Dec. 20 (Xinhuanet) -- China's new two-year anti-dumping and anti-subsidy tariffs on cars imported from the United States are not expected to have a great impact on the automobile industry, analysts said. The automakers affected by the policy change meanwhile said they are considering whether the new duties will lead them to increase the prices of their vehicles. On Wednesday, the Ministry of Commerce said the new tariff rates will range from 2 percent to 21.5 percent and the tariffs would be imposed starting the following day on cars and SUVs that were built in the US and have engines of 2.5 liters or larger. The decision was the latest retribution inflicted in a series of trade disputes that has recently arisen between China and the US. Chinese authorities, saying US imports were "damaging the local car industry", imposed the new tariffs on these companies or operations: General Motors Co (GM); Chrysler Group LLC; Mercedes-Benz US International Inc; BMW AG's factory in Spartanburg, South Carolina; and Honda of America Manufacturing Co. Many analysts said the duties appear to be a "retaliatory measure" taken by China in response to the US's refusal this year to reduce the tariffs it charges on Chinese-built tires. On the other hand, the action, which "reflects the rising tensions between China and the US on trade matters", will have only a small effect on the industry, said Bill Russo, founder and president of Synergistics Ltd, an international advisory firm. Namrita Chow, senior analyst with the information company IHS Automotive, said China is expected to import less than 1 percent of the light vehicles it needs from the US in 2012, a year in which more than 19 million of vehicles are expected to be sold in its borders. In 2010, the US exported about 3.5 billion US dollars worth of vehicles to China, an amount that is projected to increase to almost 4.5 billion US dollars？this year. Zhu Bin, a light-vehicle sales analyst for IHS Automotive in Shanghai, said the automobile models most likely to be affected by the tariffs are the Buick Enclave, the Cadillac CTS and the Jeep Cherokee. Various other models now imported from the US to China are either sold in very small numbers or are subject to such small duties that their prices will scarcely increase, Zhu said. "Despite the frenzy surrounding the tariffs being imposed on US-built models in China, the data shows that the actual impact of the move will not be dramatic," Chow said. "The new tariffs will raise prices for buyers in China, but buyers of these models already pay a hefty 25 percent import duty." "The impact on GM is very limited. GM imports less than one-half of 1 percent of its Chinese volume, and the involved Cadillac vehicles are sold to customers who are less sensitive to price," Russo said. 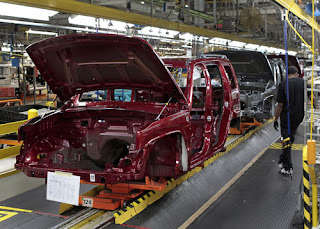 Himanshu Patel, an analyst with the financial-services company JP Morgan, said the new tariff faced by GM - which is composed of an 8.9 percent anti-dumping duty and a 12.9 percent anti-subsidy duty - will not lower the company's profits in China by much. Ford, for its part, imports only one automobile model to China and is not likely to notice a great effect. Chrysler, though, relies heavily on import sales. "The tariff impacts Chrysler significantly since they import about 24,000 vehicles, and have no local partnerships after the separation from Daimler. This action will have a significant impact on pricing for models like the Wrangler and Grand Cherokee," Russo said. Itay Michaeli, a New York-based analyst for Citigroup Inc, wrote in a note to clients that the German car maker BMW has the most "material exposure" to the tariff since it exports about 25,000 SUVs a year from the US to China. On Monday, the Chinese branches of GM, Chrysler and Daimler AG all said they have not decided how the tariffs will affect their vehicles' prices. A salesman at Da Shi Hang Auto Co, Cadillac's dealership in Beijing, said the prices of affected Cadillac models will remain unchanged in the short term. The dealer, who declined to give his full name, said the tariff's consequences may not become noticeable until after the Spring Festival, when dealers begin to sell out of the imported models they had in stock before the policy change. A dealer who sells Chrysler's Jeep brand and declined to provide his name said that the US automaker's SUVs have been quite popular recently, forcing Jeep lovers to stand in line or pay extra money to get them. "The extra tax - which amounts to several tens of thousands of yuan - won't change these potential customers' shopping list, since they are not as affected by prices as are sedan buyers," the dealer said. In response to the new tariffs, carmakers can either pass on their higher costs to consumers or try to absorb them themselves. Doing the latter will affect their profits, Russo said. “Realigning Strategic Marketing Focus to Gain Competitive Edge in China’s Automotive Market” – Complimentary Value Added Paper Reveals Emerging Trends and Provide Constructive Recommendations to the Automotive Industry. China overtook US to become the world’s largest auto market in 2009 and maintained its leadership in 2010. Volkswagen, General Motors and Hyundai were the top 3 OEM vehicle manufacturers in 2010. China remains a 70% sedan market, while SUV & MPV enjoys steady growth. Rapid urbanization will continue to drive the demand for cars. Emerging consumer and industry trends for automotive sector in China are revealed in the paper authored by Booz & Co’s Bill Russo. Mr Russo is the senior advisor at Booz & Co - a leading global management and strategy consulting firm in automotive. In his paper entitled: “Realigning Strategic Marketing Focus to Gain Competitive Edge in China’s Automotive Market”, he reviewed the market development and performance of automakers in China; outlined the current and emerging trends to anticipate; and gave his recommendations to OEM vehicle manufacturers in China. We are happy to offer this Value Added Paper on a Complimentary basis. Please email us atadmin@autoplastcon.com to get your personal copy now! China’s vast land and huge population is equivalent to the diversity of a continent. Equip yourself with insights on the automotive market by attending the AutoPlastCON on 27-28 February 2012 inShanghai. China is clamping down on overcapacity in the world’s biggest automobile market, benefiting companies with entrenched production and sales, such as General Motors Co. (GM), while hurting newcomers to the market. Foreign automakers received preferential treatment for seven years on their Chinese plants as the country sought foreign investment. Now, the carmakers will only be eligible for incentives on factories approved by the government before Jan. 30, the nation’s top economic planner said on its website Dec. 29. More important, the rules signal that China will be less inclined to sign off on new applications, according to research firm LMC Automotive. “The message is that you’re not welcome here anymore; we have enough guests,” said John Zeng, Shanghai-based director of Asian forecasting at LMC Automotive. The push may result in China shutting its doors to new foreign carmakers, benefiting earlier entrants including GM and Volkswagen AG (VOW), as their future expansion plans were probably approved by the government already, according to consulting firm Booz & Co.
“For existing players, it’s helpful because you slow down the excess competition you have here in China, which is ferocious,” said Ivo Naumann, Shanghai-based managing director at AlixPartners. GM, the top foreign automaker in China, on Feb. 16 reported record net income of $9.19 billion for 2011. Its market share in the country climbed above 13 percent last year, more than triple the 4.1 percent it held in 2001, according to the company. GM is betting demand will accelerate in China. Vehicle ownership in China was equivalent to 4.7 percent of the population, compared with about 51 percent in Japan and 81 percent in the U.S., according to 2009 figures from the Japan Automobile Manufacturers Association. The Detroit-based company plans to double deliveries in the country to 5 million by 2015. It is close to receiving approval to build a 7 billion yuan ($1.1 billion) factory, the Hubei Environmental Protection Bureau said on its website this month. China’s policy change comes as the government looks to move external investment into different industries, said Kevin Wale, GM’s China president, on Feb. 15. “In the near term, I don’t see a dramatic change in the way the Chinese government wants to run the automotive industry,” he said in Shanghai. Volkswagen said on Jan. 6 the company will add a seventh car plant in China as it expands production capacity to 3 million vehicles a year. Those who haven’t begun manufacturing cars in the country may be the most hurt by China’s move to control capacity, according to Tzeshen Cheam, a Hong Kong-based analyst at CIMB Securities HK. Tata Motors Ltd. (TTMT)’s Jaguar Land Rover, Subaru- maker Fuji Heavy Industries Ltd. (7270), Renault SA (RNO) and Fiat SpA (F)’s Chrysler Group LLC don’t make vehicles in China. While Renault and Chrysler have expressed interest in building cars in the country, Jaguar may be first to test the government’s resolve to limit capacity in a country where foreign carmakers are required to partner with a domestic company before making vehicles. Jaguar is in talks with Wuhu, China-based Chery Automobile Co. to form a venture to jointly build vehicles there, two people with direct knowledge of the matter said Feb 3. Del Sehmar, a Jaguar spokesman in Mumbai, declined to comment on the company’s China plans. Fuji Heavy has failed to win regulatory approval to build in China because the government considers the company part of Toyota, which already has the limit of two manufacturing partners, three people familiar with the matter said in September. President Yasuyuki Yoshinaga said this month the Subaru maker, which is 16 percent owned by Toyota, will keep pursuing its China plans until the end of the fiscal year in March. “Foreign automakers need China more than the country needs them,” said CIMB Securities’ Cheam. China has reason to be concerned about overcapacity. Passenger-vehicle sales slowed last year, trailing growth in the U.S. for the first time in at least 14 years. The market is crowded with more than 70 producers, some of which failed to sell a single car last year. The market share of Chinese brands in January fell almost 4 percentage points from a year earlier, according to the China Association of Automobile Manufacturers, even as German and U.S. carmakers increased their share by at least 1.5 percentage points. Mizuho Financial Group Inc. (8411), a Tokyo-based financial services firm, estimated in December that overcapacity in the nation’s auto industry began emerging last year and the glut will worsen every year through 2015. The incentives including exemptions of import duties on plant equipment and lower taxes expired Jan. 30, the first business day of the Chinese lunar year, after the National Development and Reform Commission removed auto manufacturing from catalog of industries in which external investment is “encouraged.” A fax to the NDRC’s press office for comment was unanswered. Bill Russo, a senior adviser at Booz & Co. who was formerly Chrysler Group LLC’s China head, said the rule changes mean carmakers may lose out on cost savings of about $20 million to build a factory and wait longer than the average one to two years needed to receive approvals and business licenses. Russo said projects that focus on hybrid or electric cars, invest in the lesser-developed regions of China or bring in key technologies may have an easier time obtaining approvals after the NDRC kept low-emission vehicles on the “encouraged” list. The policy shift doesn’t mean China is cutting off the flow of foreign investment into the automotive industry, LMC’s Zeng said. Premier Wen Jiabao’s government wants to divert investment into other areas such as into auto components and nurturing local research and development capability, especially in hybrid and electric vehicles, he said.